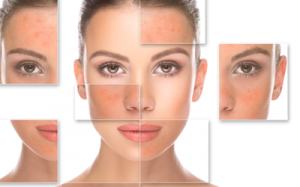 Skin discoloration can be unpleasant and concerning. This condition is usually due to chronic fluid buildup in the lower extremities. Medically, this swelling is referred to as “edema” and is commonly a result of gravity. People with swelling tend to see improvement in the morning and gradual increase in foot, ankle or leg size throughout the day. You may experience shoes, socks or other clothing to be tighter fitting on one foot than another. Other symptoms include heaviness, fullness, dull aching discomfort, changes to skin texture, numbness or tingling or, sometimes, no symptoms at all. Millions of Americans suffer from conditions involving leg swelling such as tenderness or weakness of the legs, difficulty walking, tightening of the skin and in more severe conditions, skin blisters and ulcerations. Skin ulcers are wounds on the skin that are caused by abnormal or ineffective return of blood back to the heart. This condition is also known as “venous insufficiency” and has a tendency towards showing up around the ankles and below the calves. Venous insufficiency is due to backward flow of blood leading to build up and visible protuberance of veins. This visible bulge is also known as a varicose vein. Varicose veins are veins close to the skin that have become twisted or enlarged. These superficial veins may be genetic, due to weight gain, pregnancy or occupations with long periods of standing. Varicose veins can appear dark blue and swollen and involve symptoms such as burning, aching or tiredness. More severe symptoms include changes to skin color, thinning of the skin, scaling and ulcerations. Although varicose veins are commonly not serious, in some cases, it can indicate a blood clot blocking the flow of blood in deeper veins. This condition is known as deep venous thrombosis and should be evaluated by your doctor. Your doctor can refer to a specialist to offer treatments such as sclerotherapy, laser treatments and radiofrequency ablation to close off the vein; or phlebectomy to remove the vein. A doctor can advise you on which treatment option is most suited for you after a thorough evaluation. Valley Veins has certified staff to diagnose and treat a large range of condition involving leg swelling, skin discoloration and varicose veins. At Valley Veins, we have expertise and experience in all types of varicose vein treatments, ranging from minimally-invasive to complex surgical procedures. Treatment options include sclerotherapy, laser surgery, endovenous thermal ablation (radiofrequency [VNUS] or laser), surgical vein stripping, endoscopic perforator vein surgery and other procedures. Patients may receive a combination of treatments, and most patients also use self-care therapies such as compression stockings. Valley Veins is at the forefront of newest option utilizing information from research studies in venous diseases, including varicose veins. We study the newest, most current treatments available for venous diseases. Venous specialists at Valley Veins successfully treat hundreds of patients each year with varicose veins. Currently, all insurance plans cover treatment for venous damage, including Medicare, Medi-Cal, private insurance plans, and Central Coast Alliance. A referral is not required for Medicare, Medi-Cal, or most PPO plans. Valley Veins does free varicose vein screening and information sessions. They may be contacted at (209) 656-7400. Foot, leg or ankle swelling are terms used to describe the accumulation of fluid in these regions of the body. This build up – medically referred to as peripheral edema – is usually painless and can be, in part, attributed to the effects of gravity. Edema, or swelling, is prevented by valves within veins that do not permit the backward flow of blood. As we age, these valves become weaker and allow the buildup of fluids. This condition, also known as venous insufficiency or venous reflux disease, is a common cause for foot, leg or ankle swelling and can lead to varicose veins. Although this accumulation is usually not associated with significant health risks, more serious underlying conditions such as infections and inflammation should be evaluated by a doctor. Most common causes of foot, leg or ankle swelling – such as occupations with prolonged sitting or standing – can be relativity harmless and readily identified by your physician. Rarely, swelling can be a sign of more serious disorders involving the heart, lungs, kidneys and lymphatic systems making it important to seek diagnosis and treatment. Some home remedies for foot, ankle or leg swelling include elevating the leg above the level of your heart, which can be done easily with pillows; staying active; reducing salt intake and improving your diet. It is important to visit your doctor in nonemergency situations so that the underlying cause of the edema, or swelling, can be identified and remedied. Prolonged swelling can lead to varicose veins that may be associated with mild to severe pain. In other cases, varicose veins may only be a cosmetic concern but sometimes complications arise such as skin discoloration, blood clots and skin ulcers. Many treatments are currently available to prevent varicose veins and possible complications. Valley Veins offers the most advanced diagnosis and treatment options available for patients with varicose veins. Treatment for varicose veins at Valley Veins is tailored for each patient depending on general health, age and the severity of the condition. We have expertise and experience in all types of varicose vein treatment, ranging from minimally-invasive to complex surgical procedures. Treatment options include sclerotherapy, laser surgery, endovenous thermal ablation (radiofrequency [VNUS] or laser), surgical vein stripping, endoscopic perforator vein surgery and other procedures. Patients may receive a combination of treatments, and most patients also use self-care therapies such as compression stockings. Valley Veins is at the forefront of newest option utilizing information from research studies in venous diseases, including varicose veins. We study the newest, most current treatments available for venous diseases. Venous specialists at Valley Veins successfully treat hundreds of patients each year with varicose veins. Currently, all insurance plans cover treatment for venous damage, including Medicare, Medi-Cal, private insurance plans, and Central Coast Alliance. A referral is not required for Medicare, Medi-Cal, or most PPO plans. Valley Veins does free varicose vein screening and information sessions. They may be contacted at (209) 656-7400. Do you have unsightly, purple spider veins in your face, legs or elsewhere on your body? Spider veins are a very common condition and often don’t cause symptoms. Spider veins (and more serious varicose veins and chronic venous insufficiency) are most prevalent in Western Europe and the United States. Women are most often affected, as noted in studies published by the National Institutes of Health. Even if you’re not concerned with the effect of spider veins on your appearance, it’s still important to rule out other vascular conditions that may be signaled by spider veins. Local residents are encouraged to consult Modesto vein doctors for a simple evaluation. Merced vein treatment may be covered by your insurance, especially if Patterson vascular surgeons see a deeper vein problem and recommend treatment. Pain, even if it’s a relatively minor, dull ache. It’s simple to rule out more serious, hidden vein problems and the need for vein treatment. Leg symptoms which interfere with your daily schedule or activities. A vein that’s become red, swollen, warm or is tender when touched. Your ankle skin begins to thicken or change color. One of your varicose veins starts to bleed. The appearance of spider veins or varicose is causing you distress. If you’re interested in spider vein treatment, it’s a relatively simple and straightforward process involving non-invasive methods. Don’t delay–call for an appointment at one of our local vein clinics for a vein specialist’s assessment of your spider veins. Dr. Anjani Thakur in Turlock, CA is a noted vein doctor and experienced vascular surgeon, specializing in vein conditions from mild to severe. Dr. Thakur uses the latest treatment techniques and advanced technology to help patients who need superficial treatment and those who require vascular surgery. Dr. Anjani Thakur and Dr. Vijaya Thakur offer spider vein treatment at their conveniently-located vein clinics in the communities of Turlock, Merced, Patterson, Livingston, Los Banos and Chowchilla. Contact the doctors today at CentralValleyVein.com for more information about vein health–or to schedule a consultation at one of the Valley Vein Health Centers. Spider veins are troublesome cosmetic issues for some patients. Many women believe their arrival is inevitable, but they also affect men. One of the techniques a vein clinic uses to treat them is sclerotherapy. Spider veins are small superficial vessels that become visible, typically on the legs, as they widen, according to PubMed Health. They are often linked to chronic venous disease. Risk factors for developing these tiny vessels include pregnancy, family history, use of female hormones, trauma, using topical steroids and sitting or standing for long periods. Age and obesity can also be factors. While for most people they are a cosmetic annoyance, some patients coming in for Merced vein treatment report that these red, purple or blue veins cause pain, cramping, itching, throbbing, burning or a feeling of extreme fatigue in a limb. Spider veins and varicose veins are not the same thing. Spider veins are actually capillaries. The University of Rochester Medical Center describes varicose veins as deeper, larger, a more vivid color and lumpy in appearance. Modesto vein doctors use sclerotherapy to effectively treat both spider and varicose veins. It is the oldest and most common way to treat spider veins. The procedure involves injecting an agent into affected veins. The irritation this triggers causes them to become scarred and less visible. Surgeons use a variety of sclerosing agents, among them a concentrated saline solution. Temporary side effects at the site of the injection might include bruising, small skin sores, darkened skin, areas that are red and raised and multiple tiny blood vessels, according to the Mayo Clinic. Potential but uncommon side effects are inflammation, blood clots, air bubbles and allergic reactions to the solution. As new veins appear, patients will need to return for additional treatment, sometimes every few years. Sclerotherapy is usually considered a cosmetic procedure and not covered by health insurance. Before scheduling this procedure, a physician will want the patient’s complete medical history, including medications. In certain cases, it will be necessary to stop taking aspirin, NSAIDs or blood thinners for a specified period before surgery. Surgeons perform sclerotherapy in an office versus hospital setting. It is a same-day procedure that takes approximately an hour to complete and requires no anesthesia. Some individuals feel minor stinging or cramping once the physician inserts a needle to inject the solution. After the doctor withdraws the needle, he or she will apply compression and massage the area around the vein. The number of injections used is linked to the size and the number of veins being treated. Patterson vascular surgeons who perform sclerotherapy might suggest wearing support stockings to speed healing and reduce bruising. While having a ride home after the procedure is a good idea, most individuals are able to resume their normal schedule the same day and receive instructions regarding exercising and avoiding the sun. Patients who undergo sclerotherapy at a Turlock vein clinic can expect to see positive results in just three to six weeks. Will Unsightly Veins Come Back after Vein Treatment? When patients visit our vein center for spider vein treatment or varicose vein treatment, they often wonder if their unsightly veins will return after treatment is completed. No, they won’t, but it might look they do. That’s because the original, damaged veins are obliterated by vein treatment. However, over time, other veins may become damaged and enlarged, creating new spider veins or varicose veins. Whether this happens to you depends largely on your genetics. The good news is that whenever those unwanted veins pop up, our Modesto vein doctors can take care of them right away. Once you’ve received vein treatment with us, we’ll help you keep an eye on any developing spider veins or varicose veins and take immediate action. By treating the veins early, when they’re still small, we can use simpler, quicker treatment methods to prevent those veins from ever becoming an eyesore. In addition, with a comprehensive evaluation, we can determine whether you have an underlying problem that could cause more spider or varicose veins to appear. For instance, due to genetics, some people have poorly functioning valves in the deeper veins of their legs. This condition isn’t dangerous, but if left untreated, it will most likely create more varicose and spider veins. In order to check the valves of your deeper leg veins, our Patterson vascular surgeons can use special ultrasound technology. This noninvasive, pain-free test uses sound waves to form images of the veins in your legs. This allows us to examine the valves in those veins and look for any signs of trouble. If we find any valves that aren’t working well, we can take proactive steps to correct the problem and prevent the formation of varicose veins. Our vein specialists can work with you to prevent varicose veins where possible, but sometimes, varicose and spider veins appear despite our best efforts. After all, there’s only so much we can do to combat the combined effects of genetics, gravity and aging. But when those unwanted veins do pop up, we can certainly step in with minimally invasive procedures to help you get rid of those unsightly lines and regain your smooth, youthful appearance.